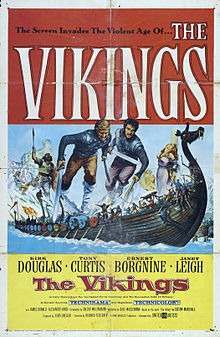 The Vikings is a 1958 epic historical fiction swashbuckling film directed by Richard Fleischer and filmed in Technicolor. It was produced by and stars Kirk Douglas. It is based on the 1951 novel The Viking by Edison Marshall, which in turn is based on material from the sagas of Ragnar Lodbrok and his sons. Other starring roles were taken by then husband-and-wife Tony Curtis and Janet Leigh as well as Ernest Borgnine. The film made notable use of natural locations in Norway. It was mostly filmed in Maurangerfjorden and Maurangsnes, captured on film by cinematographer Jack Cardiff although Aella's castle was the real Fort de la Latte in north-east Brittany in France and also on the location of the Lim Bay (Fiord) in Croatia.